Tomatoes, avocados and beans create a nutrient-rich salad. They also make salad rich in protein and fiber. Avocados are little high in fat, but it’s mostly healthy, unsaturated fat that lowers cholesterol. This salad contains dressing of mango, which adds a unique taste to the salad. Make sure to use ripe mango and feel free to experiment with different seasonings and adjust them to your likings. So enjoy this nutritious salad. 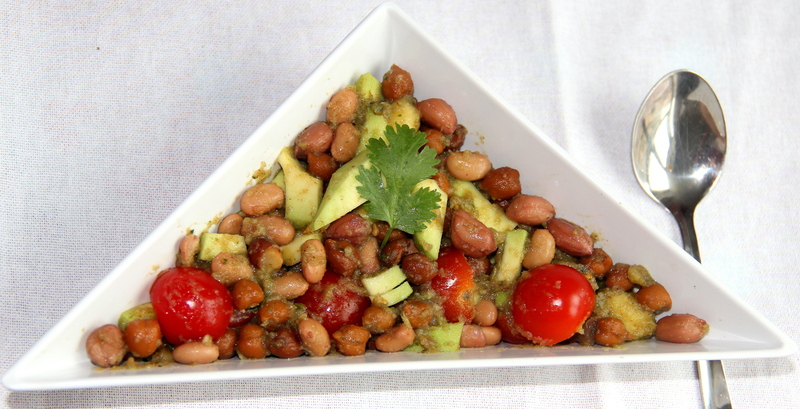 In a large bowl combine black chickpeas, soy beans, tomatoes, avocado, coriander and mix well. Pour mango dressing over this and toss until coated well. Any other veggies and legumes can be included as a variation. Posted on July 25, 2014, in Dips, International, Soups, Salad and Wraps and tagged Chitras healthy kitchen, drchdietfood, Healthy salad, Protein rich breakfast salad. Bookmark the permalink. 41 Comments. What a delectable recipe. The mango dressing is a great idea!! What a intriguing combination of vegetables and fruits! Sounds delicious, and not one ingredient in this salad that I don’t love. Mango and avocado nice combination , tangy taste would be fantastic 🙂 yum!! Avocados,lime,chickpeas n chopped mangoes! !wat a combo chitra!Love it! Oh, that sounds delicious. I love bean salads and adding avocado would make this so creamy and tasty. Happy FF and have a good weekend. Both the dressing and the salad sound really good! mango dressing sounds really interesting – I must try this! I never would have thought of the combination of legumes and mango! Cool idea! It’s mango season in South FL. This recipe is just perfect! Thanks for sharing! Beautifully made combination. Loved it so much that …. When I made this, I added Sprouted moong beans for color combination and for healthy purpose, every one in the crowd, thought I made so… much effort. Thanks very much for lovely recipes.